The Hubsan H107C has been upgraded to the Hubsan X4 Camera Plus H107C+ quadcopter and this has been a much-awaited product in the drone and quadcopter market. Its upgrades inmclude a massive redesign that makes the body of the drone sturdier and more robust. It also features sturdier rotor arms, which helps in lessening inflight vibrations, and rubber landing pads or rubber feet that giver the quadcopter's body a lesser impact fromn the force of landing. You will also find 4 built-in LED lights on the body of the quadcopter. 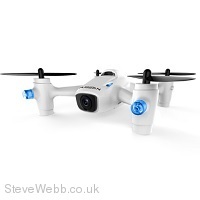 This not only gives it a cool look but it also makes it easier to spot the quadcopter, especially when flying at nighttime or in dark areas. The H107C+ quadcopter is equipped with a 720p camera that is great for recording videos and taking aerial shots, with a resolution of 1280 x 720. The camera functions include video recording and photo shooting modules. The transmitter has been updated for simple photo and video push-button operation, along with more ergonomic sticks for a better feel. The quadcopter also has an altitude mode that will allow fliers to set it to a specific altitude and thus provide a smoother flight with more stabilisation while taking videos and pictures. You can store all your media on a compatible Micro SD card, but it is not included with the quadcopter. You can easily charge the quadcopter's high performance replaceable Li-Po battery using a USB charging cable attached to a computer or laptop. This quadcopter also supports direct plug-in charging. With a voltage of 3.7V and a capacity of 530mAh, it has a flight time of about 7 minutes and charging time of 40 minutes.